With renewed interest in man’s primal antecedents, Rain Forest Wisdom offers a wealth of examples of the gorilla’s behavior and what that tells us about being human—from low-fat, high protein diet, to caring for the young to group dynamics and even leadership. Andrew Grant, former managing director of the London Zoo, draws on research, interviews and personal experience to illuminate hundreds of fascinating details on the wild mountain gorilla, one of our closest relatives—with whom we share 98% DNA—and the gentlest of primates. 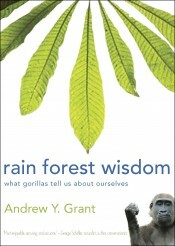 Rain Forest Wisdom examines behaviors of these fascinating animals, revealing much about our own visceral human instincts and needs. In his survey of scientific literature, Grant also delves into the primal essence of humans across a wide range of areas including diet, parenting, leadership and kinship.